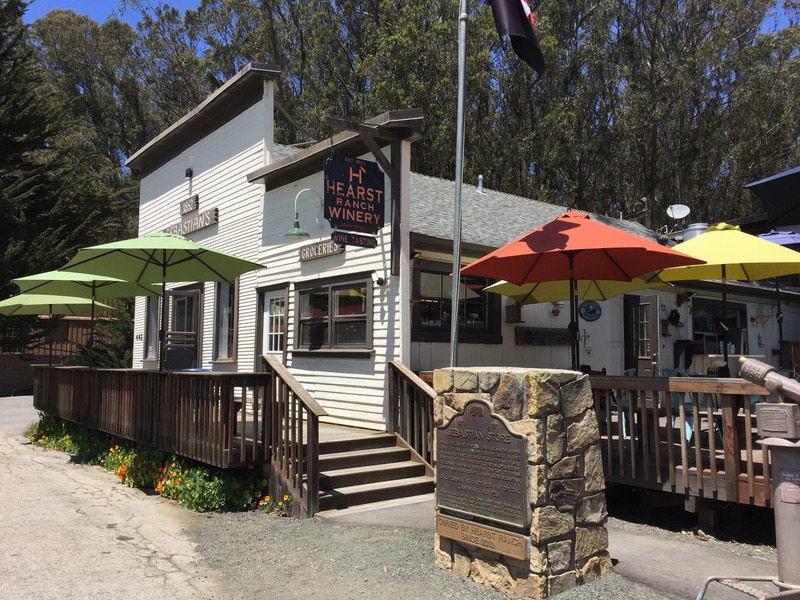 If you are looking for the best hamburgers on the Central Coast, savor the mouthwatering burgers at Sebastian’s, attached to Hearst Ranch Winery. 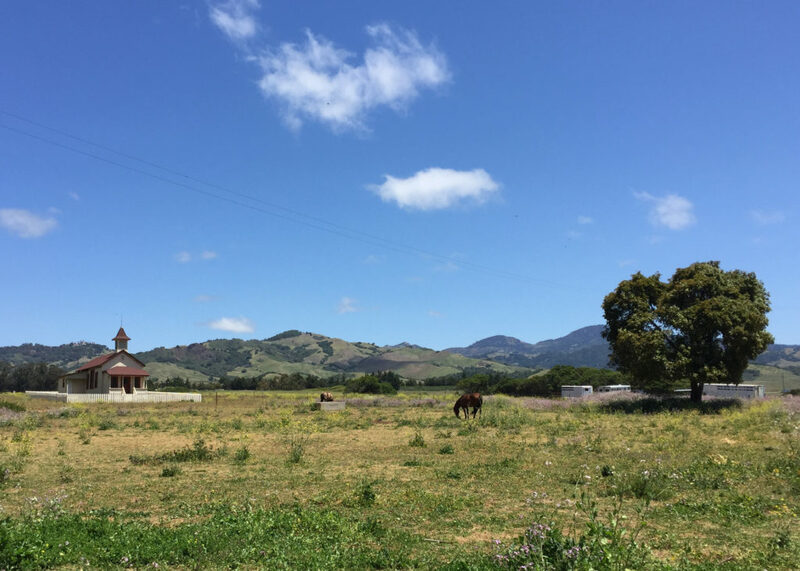 Conveniently, the adjacent winery is the perfect place to taste unique vintages in historic San Simeon. California’s Central Coast always surprises me. Every time I’m there I discover new restaurants, new wines and new places that make me want to come back for more. 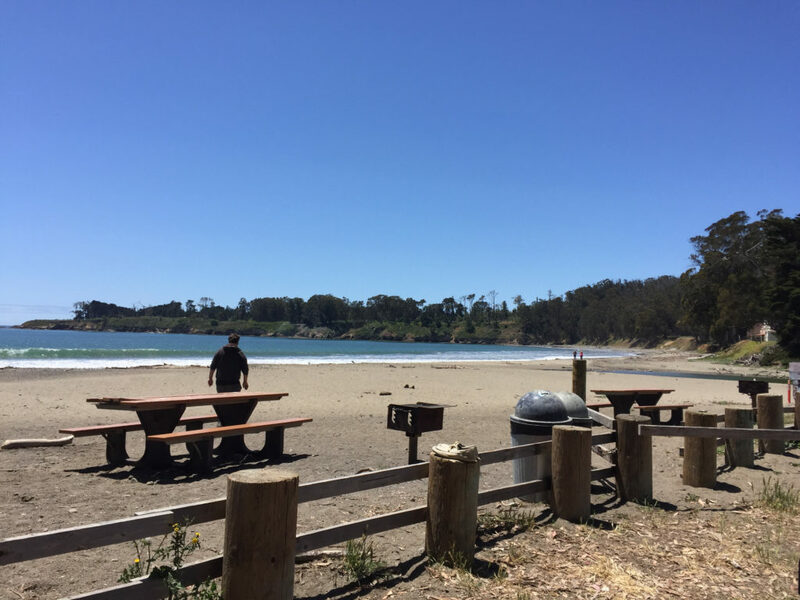 My last trip to the area was to Cambria and San Simeon, and the discoveries continued – this time it came in the form of Sebastian’s restaurant and Hearst Ranch Winery. 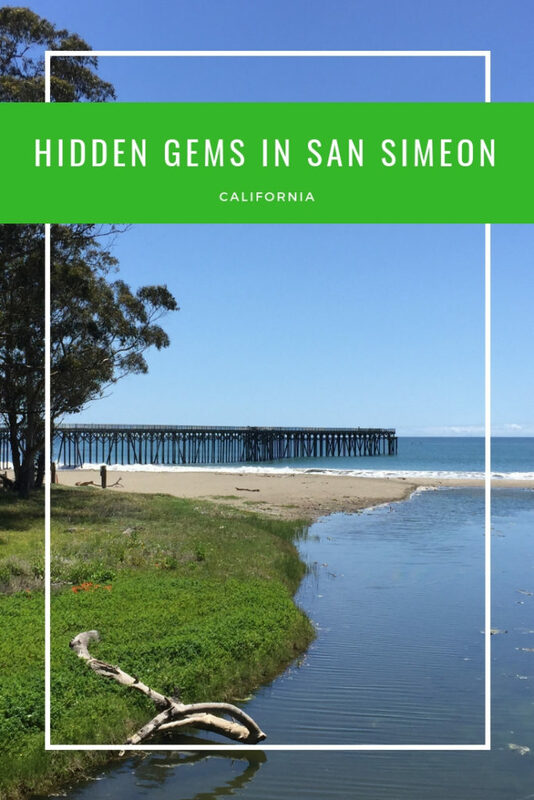 Built in 1852 (and moved to its present location in 1878) it was once the general store for historic San Simeon. You’ll see other buildings behind it, including a one-room schoolhouse, an old whaling station and what continues to be a Hearst warehouse. Most of the grounds are privately owned, but Sebastian’s and the Hearst Ranch Winery share the old store building, along with the town’s post office, which is tucked into a corner in the back. Sitting outside basking in the sun and enjoying Sebastian’s great food. 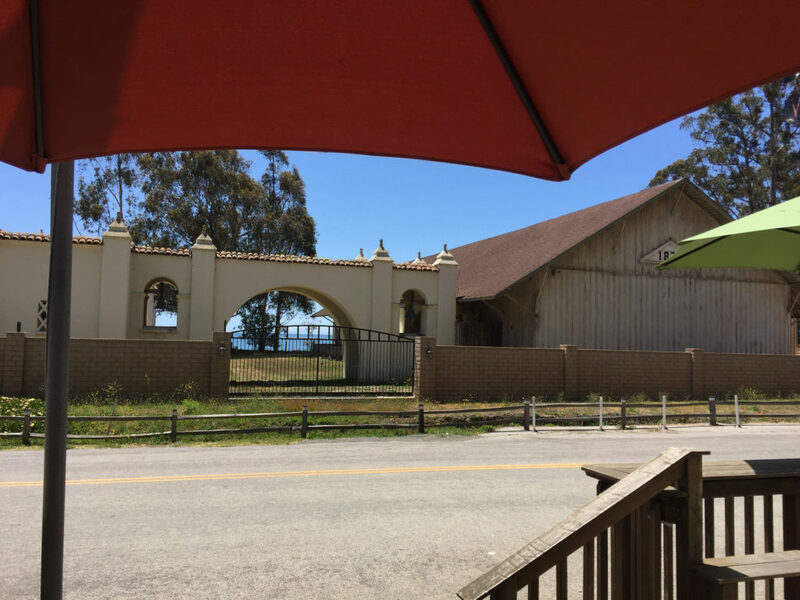 Don’t be fooled by the history – Sebastian’s is a casual restaurant with plenty of outdoor seating which overlooks the white stucco warehouse and the water beyond (the property is near the San Simeon pier). It’s known as a burger joint, and I’ve been told that the beef comes from Hearst Ranch (which is still a working cattle ranch). I won’t lie, if you are burger fan and traveling through San Simeon or Cambria, Sebastian’s is worth the detour. In fact, it’s so good that I thought about keeping it a secret, but in the end, it is something I had to share with you. You will have to keep an eye on your food because the seabirds will sit near you and calculate the odds. But it’s a friendly duel in the sun. 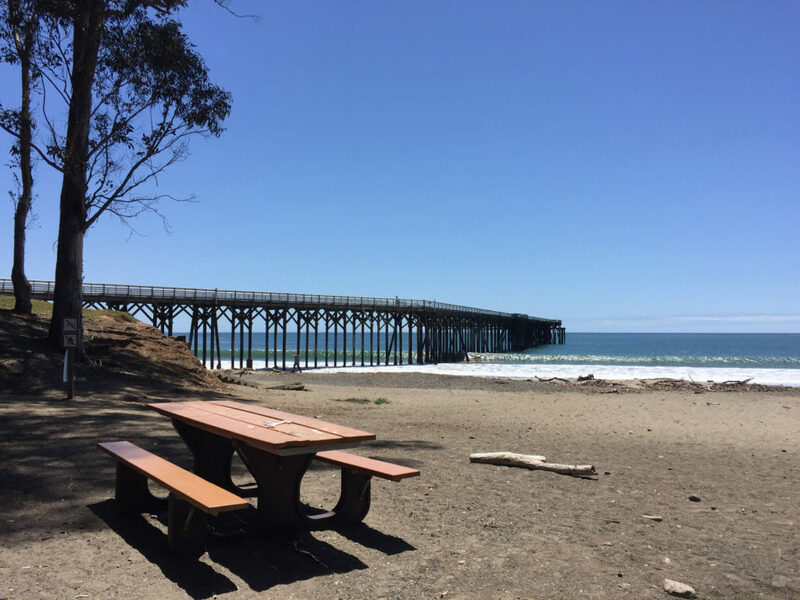 Although we had been to the area numerous times, it wasn’t until we went to Cambria for our anniversary that we finally made time in our schedule to stop. Naturally, we had to do both. We lunched at Sebastian’s and then went inside for some serious wine tasting. The grapes are grown in Central Coast Vineyards, and if you are a fan of the regional vintages, I think you’ll want to give these a taste. We chose to share the $15 Ranch Select Tasting which was mostly red wines with a lovely rosé to start. I’m a fan of rosés that have high acidity, so this one already had points in its favor before I started sipping. 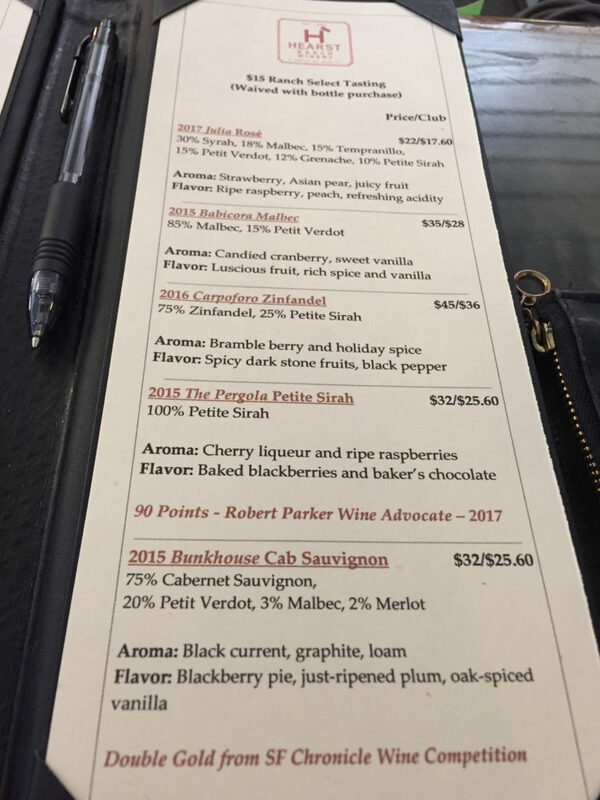 Of the others, I did love the taste of blackberries that came through in the Petite Sirah, and I can see why the Cab Sauvignon is an award-winner (it was much smoother than I thought it was going to be because California Cabs have a tendency to be “face huggers”). But, honestly, there wasn’t a single wine that I wouldn’t try again. As it was the start of summer, and the temperatures were rising, we came home with the 2017 Julia Rosé. 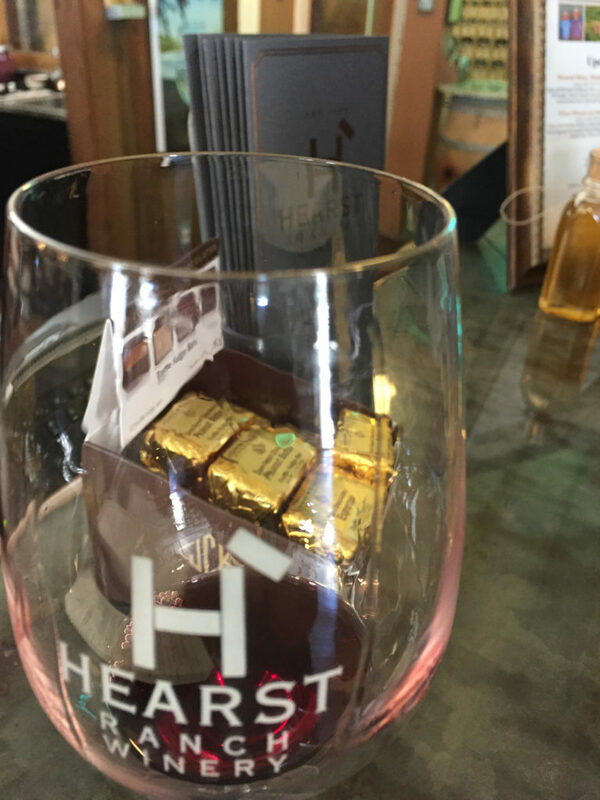 Hearst Ranch Winery does have a wine club that is pretty tempting. They will ship, but I think we’d be tempted to join just to have an excuse for another weekend on California’s Central Coast. After you are done eating and imbibing, plan to take a relaxing walk down to the beach. It’s a beautiful, quiet area. We were there in May, and we didn’t see lifeguards, so I don’t know about the swimming situation, but it’s a beautiful place to relax on the sand and to walk along the water. 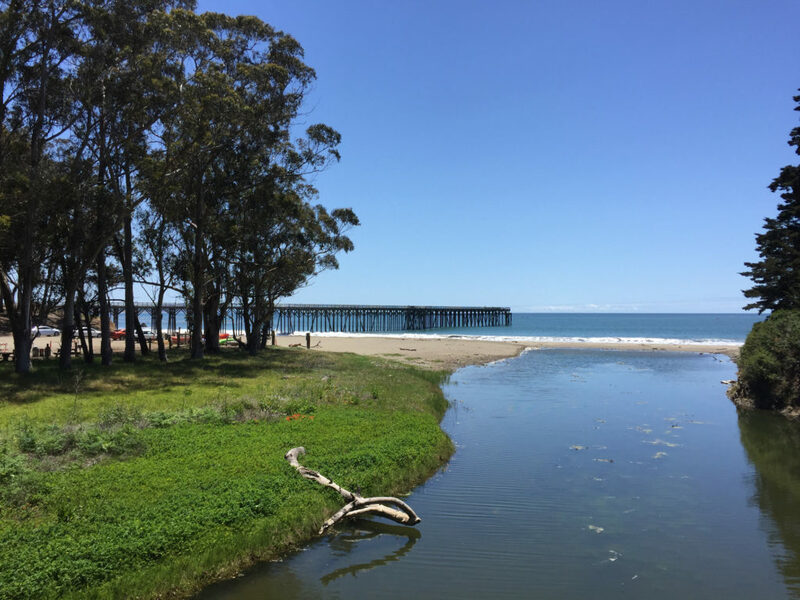 Apparently, there is a trail that goes all the way around to the forested area at the north end of San Simeon Bay. You will see horses in the area, and chickens will cross the road. I wasn’t fast enough with my camera to catch it, but the chicken did cross the road in front of us, and Andy did ask it why. 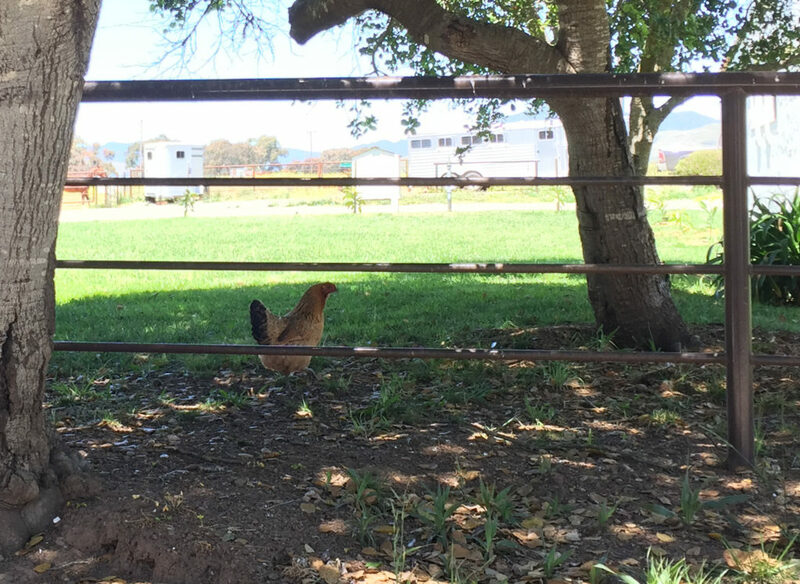 The chicken kept on crossing without a word, so the mystery continues. The historic schoolhouse and the horses who now call it home. In case you are tempted, you should know that there is a historic adobe across from the winery that is on HomeAway.com. It has gorgeous views and would be perfect for anyone who wanted to stay by the water, explore the winery and then head up to the Castle. Of course, it also means easy access to the incredible burgers at Sebastian’s.